Romans have been making Romano cheese for over two millennia. Romano cheese, which is usually grated, is very hard and tastes salty and sharp. With a rich creamy yellow color, Romano cheese either comes from sheep's milk, called pecorino romano; goat's milk, called caprino romano; or cow's milk, called vacchino romano. To make Romano cheese, the curd is drained immediately after molding. This method is called "rummaging the curd." The cheese is then aged for five months before eating. Pecorino Romano is a creamy-white cheese made from sheep's milk in the vicinity of Rome. The curd is drained, then pierced to make fine holes, then salted.The technique used to make Romano cheese involves rummaging the curd, meaning that the curds of the cheese are drained and pierced before being salted and brined, yielding a unique hard cheese which is popular all over the world. Buying: When selecting a wedge of Romano cheese, try to taste cheese from that wheel, if possible. Most reputable cheese dealers will provide you with a small sample, which you should roll around in your mouth so that all of your taste buds can sense the flavor. Procuring: North American Romano is usually made from cow's milk. In North America, the aged, hard version is the most common, but in Italy you can also get the younger, softer versions which can't be grated.In Europe, Pecorino Romano is an EU PDO protected cheese. 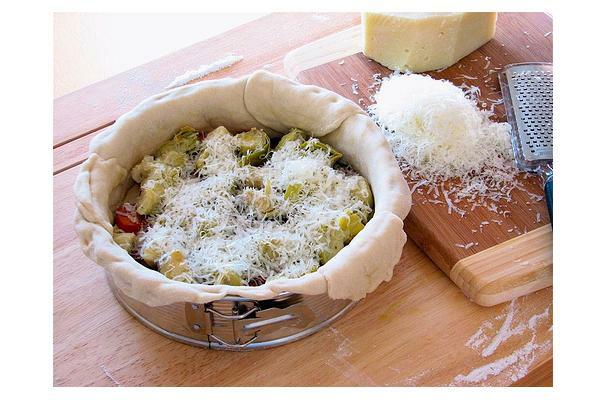 It can only be made in Italy in the regions of Lazio and Sardinia, and in the Grosseto province of Tuscany. Romano is most often used on pasta dishes, like the better-known Parmigiano Reggiano (parmesan). Its distinctive aromatic, pleasantly sharp, very salty flavour means that in Italian cuisine, it is preferred for some pasta dishes with highly-flavoured sauces, especially those of Roman origin. Cleaning: Use running water to clean cheese. Romano cheese can be frozen if it's first cut into small (1/2 pound) chunks, and wrapped in an airtight package. Thaw in the refrigerator, and use it up soon after it's thawed.